Being the second youngest of thirteen children growing up during the Depression, Edward DeSmet '58 knew that meeting the basic needs of the family came first. The family was poor, and as his nephew James DeSmet recalls, "When Uncle Ed recounted stories of his early life, the common phrase often used was 'hard work.'" As a young man, Edward served his country in the Korean War before entering St. Ambrose College. After two years, he attended the University of Illinois to finish his mechanical engineering degree. His career kept him in the Midwest, first at Conco Incorporated in Mendota, Ill. for 20 years where he became a plant manager, then at International Harvester as a manufacturing facilities planning engineering, and finally at the Rock Island Arsenal as an engineer where he received numerous awards. James remembers Edward's devotion to his church and faith. "When he was feeling lonely or in need of emotional uplifting, he would go to the church and just listen." That devotion was also evident in Edward's will. He named four beneficiaries, including St. Ambrose University. All shared some connection to Edward's faith. "He was a very giving person so providing to those less fortunate was just natural for him," James said. "His wish for leaving a monetary gift to St. Ambrose University was that his gift would assist others to reach their educational potential." Following Edward' passing in August 2017, St. Ambrose University worked to ensure his wish would be fulfilled and his legacy would continue. At St. Ambrose, Edward designated his gift to support the Annual Fund. According to Margaret Babbitt, Director of Annual Giving and Advancement Communications, this fund perfectly coincides with Edward's wish to help others reach their potential. 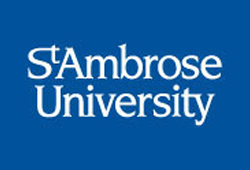 "The Ambrose Annual Fund supports all aspects of a St. Ambrose education," Babbitt said. "In addition to providing financial assistance to students, it is crucial in sustaining the quality of the teaching and learning that occurs at St. Ambrose University. Gifts to the Ambrose Fund help students aspire to make the world a better place, knowing that those who came before them, like Edward DeSmet, are behind them all the way, enriching the lives of others."